Finally the summer’s heating up…. and so are the tunes! Enjoy! This month, with a holiday and the big celebrations for the Diamond Jubilee here in the UK I haven’t been able to spend the usual time on my favourite pastime - choosing & buying new trance tracks! - so I’ve had a dig around and chosen some belters from a year or 2 ago which I love but haven’t heard in a while. Hope you enjoy! A quality-packed Force Factor this month including one of my favourite tracks at the moment - Indecent Noise’s insane remix of Forbidden City by Marc Simz which is just exploding with retro-sounding energy. Plus dusting off two fantastic records from a few years back from the incredible Vinylgroover & The Red Hed. Spring is here so get the car windows down, volume up, and pump out some of this tech & hard trance to help your neighbours’ gardens grow! Some huge tunes from Jason Cortez, Luke H and many more! Tech trance time! 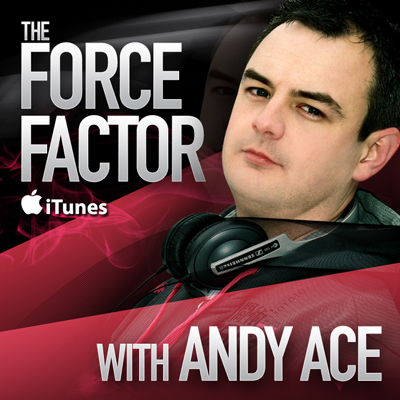 February’s Factor gets the rave juices flowing but - for this episode - doesn’t stray over into the territory of hard dance… this is 100% gritty trance from the likes of Askew, Patterson etc (my favourite kind!). Hope you agree! Lots of bootlegs/remixes/mashups in this one, so if you like that sort of thing you’re in for a treat! A few producers including the awesome Bryan Kearney kindly distributed some excellent productions over xmas so I’ve included a few to get the year off to a banging start. Plus a great guest mix from up & coming Vancouver based DJ, EYC. If you want a big soundtrack for your xmas party, look no further! :) Loads of great new trance plus some cheeky remixes of Lost Tribe, Armin Van Buuren and even Rihanna! Have a great xmas and don’t forget my “2001 special mix” for Afterhours.fm’s End of Year Countdown - midday on Christmas Day! My set from this year’s UK In The Mix 005 event on Afterhours. A massive guestmix from up & coming producer Lee Miller follows some rather large new tunes from the likes of Will Atkinson with Breath It and Brian Cameron with Engage, two of my fave tracks at the moment. Plus (by complete coincidence) another great remix of Paramore’s Crush, this time with Costa Pantazis on mix duties. Better late than never hmm?! So.. Paramore in a trance mix?!! I came across an American tech-trance DJ called Fei Fei this month and I’m loving her sound, see what you think! Great new releases from some of the big guns of trance make it a storming September! Plus on the harder side, Costa Pantazis/Ashley Waters and April manage to keep their full-throttle sound melodic & uplifting - love it. But Indecent Noise’s “Grim Reaper” has to be my favourite track for bloody months - incredible. As the Aussies like to say… banging like a dunny door in a thunderstorm. This is a set called ‘End of Integrity 2’. It’s similar to a mix I made last year (called, guess what… End of Integrity), but with a bit of extra integrity squeezed painfully out of it. Warning: If you are hoping for the latest Force Factor, you will be deeply disappointed. That will follow in a few days. In the meantime… do not download this MP3. You have been warned. So as you probably know by now I love the old skool sounds and August’s mix is chock-full of them! A new remix of the 1997 Lustral classic ‘Everytime’ by Kipster, Amen UK’s 'Passion’ from 1995 remixed by Neon Lights, plus the old-skool flavour that runs through Rob O.T.T’s This is the Time. Hope it gets your rave juices flowing! Two for the price of one this month! Your usual dose of Force Factor tuneage, plus a fantastic hour-long guestmix from someone whose fast-paced trance productions I’ve been banging out for ages, so you’ll already be familiar with his sound - Burak Harşitlioğlu. Thanks for the mix Burak, & enjoy everyone! Making up for last month with a big fat dose of the fast stuff! Some great tracks around right now including a fantastic mashup if you like Chase & Status, and loads of huge new hard trance, perhaps my favourite being ‘Popcorn’ from C&D Project - amazing tune. Thanks to all you folks on Facebook for all your birthday messages this month! Enjoy the mix! This month’s mix is a big bag of tunage fresh from the large trance department, energetic as ever, but without much hard trance due to a lack of good quality new hard trance tunes when I recorded it earlier this month. Probably some of you will be pleased with that while others will miss the hard stuff, so I’ll be interested to hear your opinions! Quality fast-paced techy trance sounds from the off, including what has become one of my favourite tracks ever, Daniel Kandi’s remix of Cosmic Gate’s “Human Beings”, love that track! Also watch out for a new remix of Armin’s classic “Shivers”.